50°01' N, 27°22' E. The village is within the Khmel'nyts'kyy Oblast in western Ukraine. 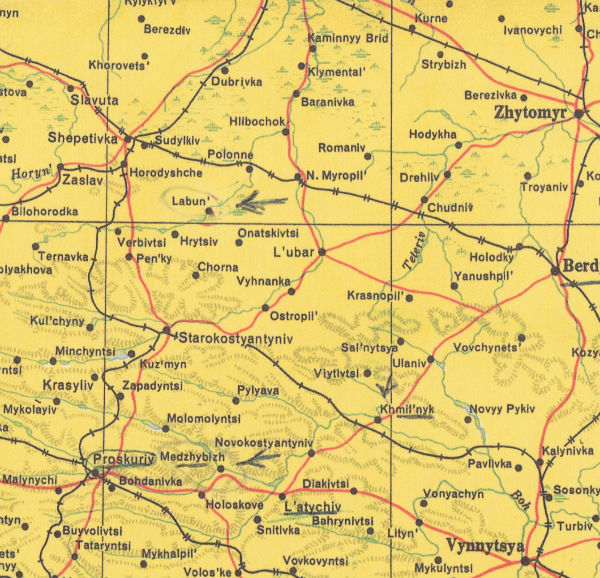 Yurovshchina is represented, above, by the gray square south of the word Zhytomyr. 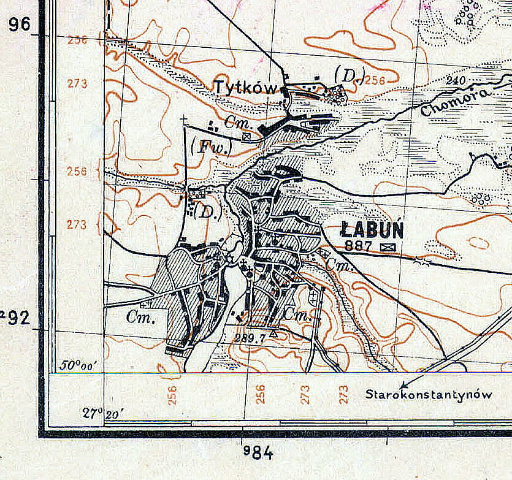 Labun and nearby communities, 1955. For scale, Starokostyantyniv is about 20 miles from Labun; Polonne, about 10 miles; Hrytsiv, about 8 miles. Red lines indicate roads. The black lines with hatch marks are rail lines: single hatch=single track; double hatch=double track. The nearest rail access for Labun was in Polonnoye. Special thanks to Peter Myers who found the source map in a New York City bookstore ("The Map of Ukraine," Sponsored by the League of Americans of Ukrainian Descent, State Organization of Ukrainian Congress Committee of America, Chicago, Illinois, 1955). 10 miles SW of Polonnoye (Polonne) and 8 miles ENE of the closest neighboring Shtetl: Gritsev (Hrycow). Labun, 1931. This is a small corner of a larger map centered on Polonnoye and shows developments within the town. The map was made by the Polish Military Geographical Institute. Cm.= cemetery; Fw.=grange (i.e., outlying farmlands, historically belonging to a feudal lord); solid black dots with crosses=churches or temples; the triangle with 289.7 indicates a survey marker at 289.7 meters above sea level.